The ingredients in this salad are so tangy that no salad dressing is needed, keeping the salad light – just how it should be. 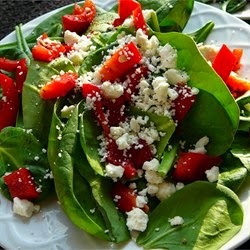 The sweetness of the red bell peppers complements the feta and cracked pepper so well. Has a kick – great for pepper lovers!